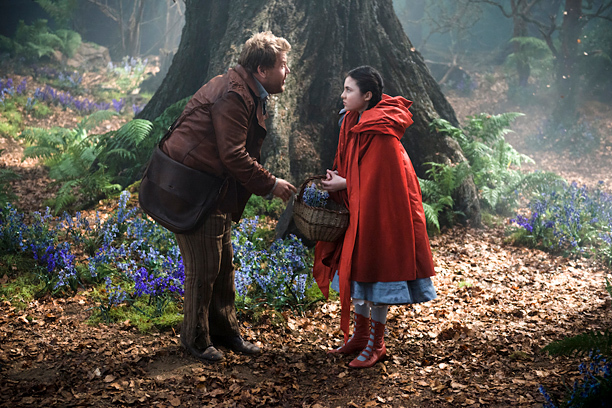 Into the Woods has had a long journey to the big screen. Ever since the ‘90s, filmmakers have been trying their hands at bringing Stephen Sondheim’s musical subversion of the fairy tale genre to the big screen, with actors such as Robin Williams, Steve Martin, Cher, Neil Patrick Harris, Billy Crystal, Meg Ryan, Kyle MacLachlan, and Elijah Wood all attached at one point or another. 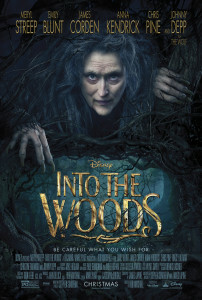 And after 2 decades, multiple screenplays, several false starts, Into the Woods is finally in cinemas, with an all-star cast, Oscar-winning director Rob Marshall at the helm, the support of Sondheim himself, all under the banner of the company that build an empire on fairy tales, Disney. And it’s incredibly okay! For those unfamiliar with Into the Woods, a basic primer: the tales of Cinderella, Little Red Riding Hood, Rapunzel, and Jack and the Beanstalk intersect with a tale of a Baker and his Wife searching for a set of magical objects in order to break the curse set by a Witch. Sounds like simple, innocent fun, right? Well, that’s only the show’s first act. In the 2nd act, everyone’s action come back to bite them, several major characters meet their ends, and happily ever after becomes easier said than done. It’s a dark show, especially given the fact that it doesn’t try to let slip just how dark it is until things truly go south. I’ll admit “incredibly okay” is better than I’d expected. Every Into the Woods fan had reason to be wary, what with rumors of changes to the plot and removals of several deaths and twists, the casting of the master of not trying anymore, Johnny Depp, and the hiring of Rob Marshall, whose films just got worse and worse after Chicago, culminating with the billion dollar earning war crime known as Pirates of the Caribbean: On Stranger Tides. And quite frankly, all of those things are still serious problems in the final film. With the removal of many of the show’s dark turns, the second half feels anemic, telling us how dark it’s gotten, but rarely showing it. Johnny Depp is, in fact, horrible, half-singing while wearing what I can only describe as terrible Tex Avery-cosplay. And Rob Marshall is…fine? Thankfully, none of the musical numbers take place in a dream space this time, with most instead based in a soundstage filled with trees. The film’s cast, apart from the aforementioned Depp, all turn in fine performances. James Corden has a natural likability and charm that make The Baker an effective audience surrogate. Anna Kendrick handles Sondheim expertly as Cinderella, though those looking for your Kendrick musical fix may be better served by the upcoming The Last Five Years. Emily Blunt, meanwhile, injects the film with a desperately needed heart, and if there’s one reason why this film’s final act doesn’t completely fall apart, it’s her. And yes, Meryl Streep is great, though she’s no Bernadette Peters, with a performance that feels a bit more heightened than the rest of the cast, often feeling as though she’s visiting from another, possibly better film. The standout, however, is Chris Pine, as Cinderella’s Prince. His big number, “Agony,” performed with Billy Magnussen (playing Rapunzel’s Prince) is a piece of comedic genius, and the closest the film gets to being visually interesting. On the whole, however, Into the Woods is a film perfectly fine with doing the bare minimum. It gets the audience through the story in a little over two hours, gets some A-list actors successfully singing Sondheim, and renews interest in the original show. There isn’t much more than that. And yet the film doesn’t do anything especially heinous, apart from Depp’s extended cameo. To paraphrase Meryl Streep’s Witch, Into The Woods is not good, it’s not bad, it’s just nice. And that may be the greatest disappointment of all. 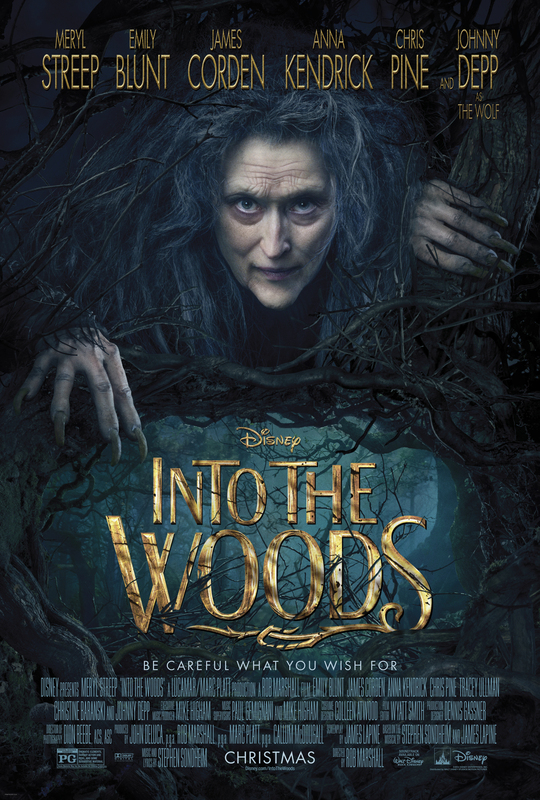 Into the Woods opens today in Philly area theaters.